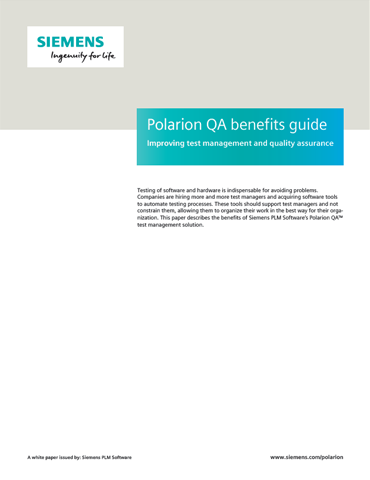 Download now: "Polarion® QA™ Benefits Guide,"
Testing of software and hardware is indispensable for avoiding problems. Companies are hiring more and more test managers and acquiring software tools to automate testing processes. These tools should support test managers and not constrain them, allowing them to organize their work in the best way for their organization. This paper describes the benefits of Siemens PLM Software’s Polarion QA™ test management solution.